The Torresian imperial pigeon (Ducula spilorrhoa Gray, 1858) belongs to the order of the Columbiformes and to the family of the Columbidae and is part of the group of the Ducula, a genus that has undergone during the last decades a deep taxonomic reclassification. A work that has not yet been completed and that is not always shared that has seen its initial reclassification from subspecies of the Ducula bicolor to independent species, in which have been then identified other subspecies that some want in their turn to consider at the level of species. In fact, a very fluid situation and that will get in the future further modifications. All these pigeons are considered as belonging to the group of the imperial pigeons, a group that lives in an ample insular territory formed by a high number of islands and islets and on which often have developped quite similar species and subspecies. The common name imperial comes from its haughty and elegant posture that have deserved it such appreciation and have even distinguished it also among the members of the same family that are already natural expression of elegance and refinement. Also the etymology of the scientific name has been determinant in the common denomination of this bird. The genus Ducula has a Latin origin and comes from “dux-ducis” = leader, become later on dux, kaiser, duke, ducula that has then led to the vulgar name of imperial given in Italian as well as in the Anglo-Saxon world. The term identifying the species spilorrhoa is of Greek origin and comes from the composition of the term “spilos” = spot, with “orrhos” = to sit, with a precise reference to those characteristics that distinguish the species to which previously was assigned. This bird is called in many names in the places where it lives, from Nutmeg pigeon to Australian pied imperial pigeon, from Torresian Strait pigeon to White nutmeg pigeon and only from these names we could alread imagine the characteristics and the place where it lives. 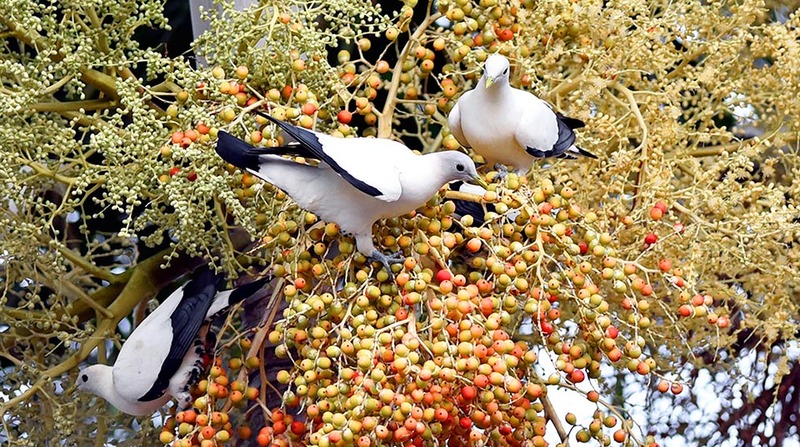 In Australia this bird till a few decades ago was object of a fierce hunting due to the goodness of its meats but even more because deemed cause of damages to the ever growing crops in the territory of Queensland. As happened for the North American Passenger pigeon (Ectopistes migratorius), immense flocks covered the sky of Cairns in the York Peninsula, during the evening gatherings in the night dormitories. They were seen approaching high from any direction and swoop into these thickets to spend there the night but the hunters were waiting for them to make real slaughterings. It is well known the end met by the American pigeon due to the intense hunting to which it was subjected so much to lead it, just a century ago, on September 1st, 1914, to the final extinction. Conversely, our pigeon has been able to recover, after intense protectionist struggles that have drastically forbidden such destruction and now has come back to numbers sufficient to ensure itself a prosperous future. A simple walk on the Cairns Esplanade, that long and enchanted garden facing the ocean and here do magically appear on the trees all around and in good number, this magnificent and elegant pigeon. Some European names give to this bird are: in English Torresian imperial pigeon, in German Kaiserfruchttaube, in Italian Piccione imperiale dello Stretto di Torres, in French Carpophage argenté, in Spanish Dúcula australiana and in Japanese a likeable Papuasodegurobato. Already from some of the vulgar names we can easily understand what is the range occupied by this bird. The Torresian imperial pigeon has the epicenter of its range rightly on horseback of this earthly narrowing that divides the Australian continent from New Guinea and the Indonesian archipelago. Furthermore, it occupies an endless series of small islands and tiny archipelagoes, such as the Trobriand, the Woodlark, the Lousiades, the Aru and the north-eastern coasts of Australia and part of the North West Territory. The southern coast of Queensland is the extreme southern limit of this species. Between the about forty classified species up to now on the genus Ducula, the Torresian imperial pigeon stands among those with a very limited range and consequently more subject to possible negative impacts in the case of modifications even natural of their habitat. The present population has nowadays reached some tens of thousands of specimens but the level of attention is not to be lowered. This bird is sedentary even if have been noted local movements due mainly by the search for food that often happens flying over short stretches of sea to reach one of the innumerable islands that are dotting these oceanic areas. The Torresian imperial pigeon lives mainly in coastal forests, woods of eucalyptus (Eucalyptus spp. ), bushes of melaleuca (Melaleuca spp.) and of mangroves (Rhizophora spp.) especially on islands and always close to the coast but willingly and more and more frequently frequents settlements looking for the arboreal and fruiting species that are planted in gardens or cultivated in fruit orchards. The North Australian public gardens are nowadays usually inhabited by these birds and often they can be seen also nidifying in isolated copules, notwithstanding the normal habits of high sociality they show during the nidification period. Though quite shy, they allow by now to be approached in particular when busy in group in gobbling greedily seeds and ripe fruits. These pigeons swallow usually whole fruits, even big, as they have a mouth with a rather broad opening and a very capacious goiter whereby after the digestion the seeds are expelled practically whole thus facilitating the diffusion of many essences. For this purpose they use to swallow rubble for facilitating the grinding of the fruits and the detachment of the seed contained. The seed is regurgitated but often also expelled directly with the feces. T All Ducules have similar dimensions and three of them have also quite similar liveries that render them indistinguishable when not sufficiently close to note those small particulars that differentiate them. Luckily, two of them do have distinct ranges and do not get in contact with one another. A situation that is however fairly particular and interesting. 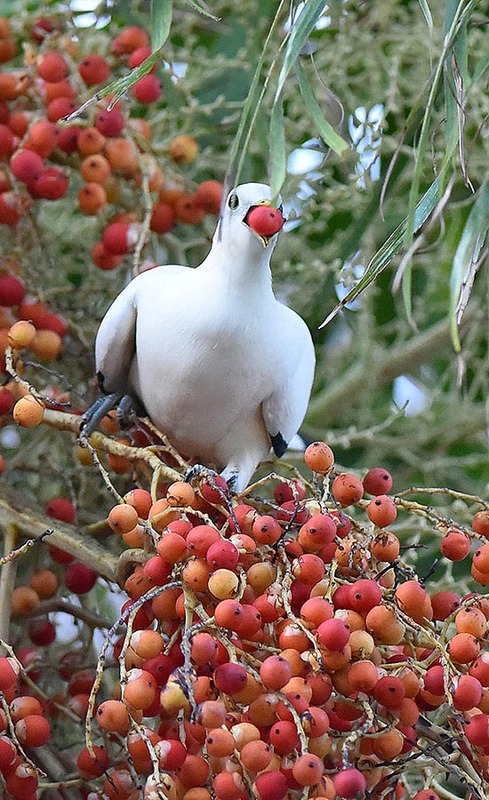 The Pied imperial pigeon (Ducula bicolor) is the most similar to the Torresian imperial pigeon and has, moreover, in the extreme south of the range, an overlapping portion of territory. 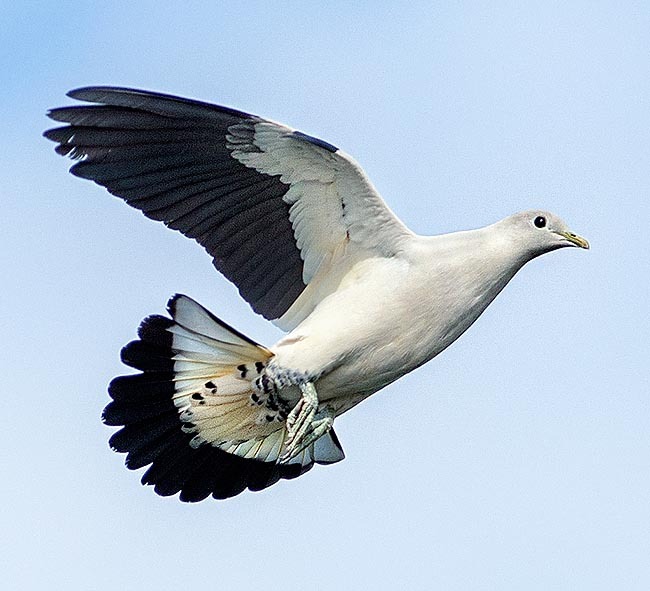 The Silver-tipped imperial pigeon (Ducula luctuosa) lives together with the Ducula bicolor but only on the Sulawesi Island and therefore does nor have any contact with the spilorrhoa. Finally, the Yellowish imperial pigeon (Ducula flavescens) considered at times as a subspecies of the Torresian imperial pigeon, appears to be living only in the Bismarck archipelago ans has no contact with anyone of the other two. It is about 44 cm long, with a weight up to 550 g and a wingspan of 45 cm. It has a rapid and powerful flight with deep and complete wing beats expressing a remarkable cruising speed, so much to easily exceed the 80 kmh. Typical is the behaviour held by this bird during the courting, when the male with its particular wavy flight characterized by wheelies and subsequent glides, flies over its own territory indicating its possession. Then the usual deep and sombre cooing while urges the female for coupling and finally the preening of consolidation of the couple relationship. This pigeon usually nidifies in even very numerous colonies of some thousands of couples, occupying dense coastal areas, intricate and often non accessible from the ground. The place of nidification may be even far from the feeding sites so much that its morning or evening movements in large number, have often been the only way for measuring their consistency and presence in uninhabited and remote places. It builds the nest on the low branches of the platforms of small twigs covered inside by roots and small leaves. Nevertheless, the nest is extremely weak and transparent, so much to be able at times to see from below through it its contents. 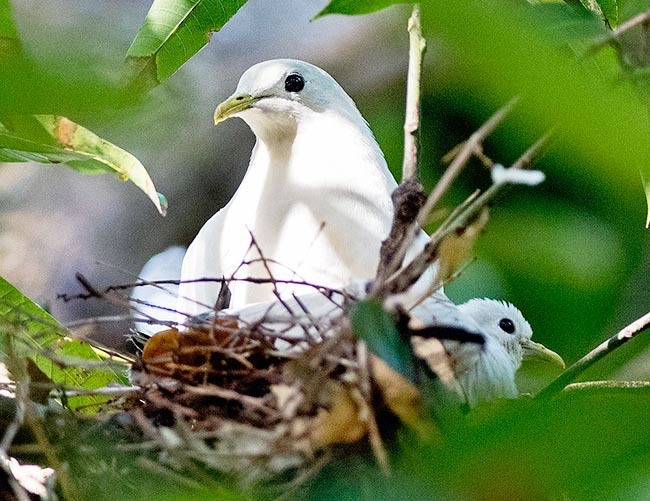 Like all columbids also the Torresian imperial pigeon lays usually two eggs but quite often limits to only one that hatches for about 28 days. The chick is assisted by both parents for four weeks more and only after the first year the maturity is reached. Carpophaga spilorrhoa G. R. Gray, 1858.